The current treatment paradigm of type 2 diabetes is the blood glucose paradigm. Under this paradigm, most of the toxicity of T2D is done by the hyperglycemia. Therefore, it follows that lowering blood glucose will amerliorate the complications even though we are not directly treating the T2D itself (high insulin resistance). The ACCORD study was a test of this glucotoxicity paradigm, and unfortunately, a complete and abject failure. Patients were randomized to tight blood glucose control versus usual control, with the expectation that tight control would show tremendous benefits. Instead, the trial proved there were none. The mainstream media is picking up the fact that our current drug therapies for type 2 diabetes don’t seem to be of much use to anybody. The Canadian Broadcasting Company, for example, headlined that ‘New Study questions type 2 diabetes treatment – No evidence glucose lowering drugs help ward off complications”. Exactly right. Drugs don’t cure a dietary disease. Type 2 diabetes is a disease of insulin resistance and hyperinsulinemia. So why focus on lowering blood glucose, which is only the symptom? Isn’t that useless? Yes. Yes it is. You need to lower insulin, not glucose, because the disease is about too much insulin. The problem is one of perspective. As long as you believe that hyperglycaemia is the main cause of morbidity, you expect that lowering blood glucose to provide benefits. The ACCORD proved this glucotoxicity paradigm is incorrect. Instead, the high blood glucose results from insulin resistance. That is the disease. And insulin resistance is due to hyperinsulinemia. Imagine it this way. Type 2 diabetes is essentially a disease of too much glucose in your body. Not just the blood, but the entire body. If you fill up the cells of your body with glucose, pretty soon, no more can be pushed into the cells, so glucose spills over into the blood. But the underlying problem is an overflow problem. Insulin resistance is an overflow of glucose. Using more insulin to move the toxic glucose from the blood into the cell accomplishes nothing. This is exactly what the study showed. If you have too much glucose in the body, you can do two things – don’t put any more in, or burn it off. Simply moving the glucose around the body so you can’t see it is not useful. And that’s what all these medications do. Interestingly, the ACCORD study was not the first failure of the blood glucose paradigm. The UKDPS study was also unable to significantly reduce cardiovascular events or prevent deaths with intensive blood glucose lowering in type 2 diabetes. This was not even the first time that treatment increased death rates. The Veterans Affairs Diabetes Feasibility Trial also found an increase in death rates in the intensive group, but it was not statistically significant because of the small trial size. The earlier University Group Diabetes Program had also compared an intensive versus standard group. It, too was unable to find any benefit to intensive treatment. One certain subgroup, suing tolbutamide (a sulfonylurea medication that increases insulin) did have a higher death rate, though. It would also start a parade of failures including the ADVANCE, VADT, ORIGIN, TECOS, ELIXA and SAVOR studies. It was not a single study that failed. There were multiple failures all over the world. The failure should have burned away the prevailing glucotoxiciy paradigm like Enola Gay’s kiss. Certainly, at very high blood sugars there is harm to the body. But at the moderate levels of blood sugar seen in controlled type 2 diabetes, there was no benefit to further lowering. If you lower the blood glucose with medications such as insulin, there is no benefit. So clearly, the damage to the body does not result from glucotoxicity alone. The problem is that insulin itself in high doses can be toxic. All these trials used medications that don’t lower the insulin. Both insulin and sulphonylureas increase insulin levels. Metformin and DPP4 medications are neutral for insulin. TZDs like rosiglitazone do not increase insulin, but increase insulin action. If the problem is both insulin toxicity and glucotoxicity, then increasing insulin toxicity to reduce glucotoxicity is not a winning strategy. And all the studies were there to prove it. By 2016, a meta-analysis of all studies proved conclusively the futility of the blood glucose paradigm. Whether you are looking at overall deaths, heart attacks, or strokes, tight blood glucose lowering had no benefits at all. For example, the Canadian Diabetes Association in 2013 guidelines still continues to recommend a target A1C of 7%. Why? Haven’t we just proven that lowering A1C from 8.5% to 7% provides no benefit? Why would we give more medications for no benefit. Isn’t that totally stupid? Yes… Yes it is. But there you go. The CDA can’t very well say “We have no clue what you should do”, so they give guidelines that go directly AGAINST the available evidence. Kind of like a Bizarro world Evidence Based Medicine. Then they write “Glycemic targets should be individualized”. If there should not be a target, then say so, dammit. This is precisely what this paper describes. 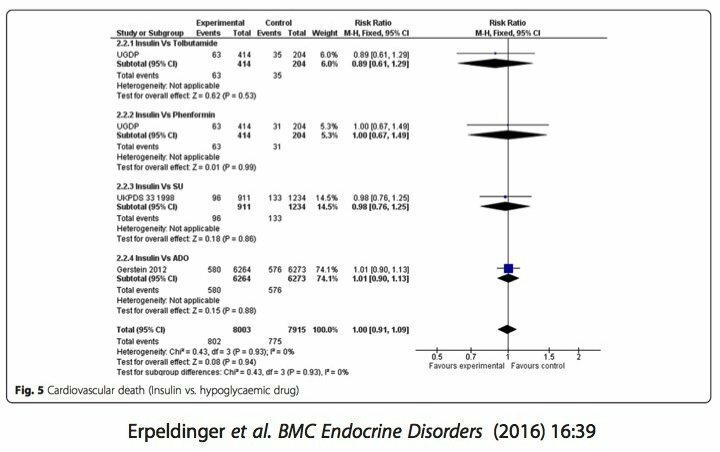 There is no evidence for benefit of tight glcemic control, yet 95% of diabetic guidelines recommend target blood glucose and tight control. WTF?? 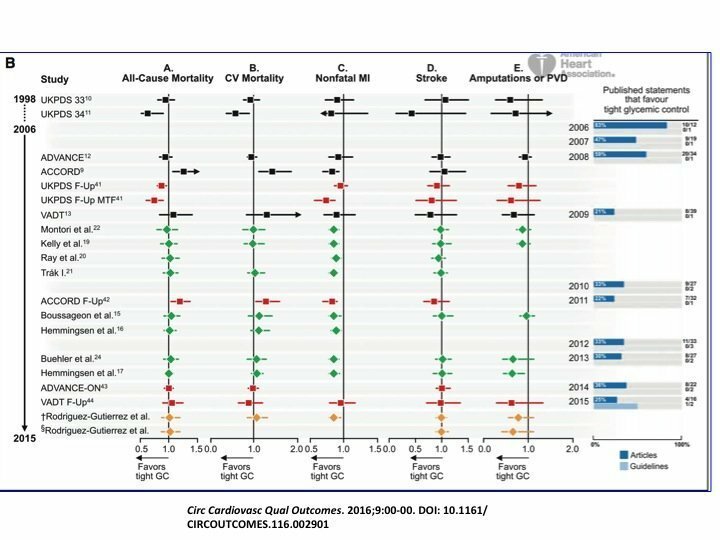 This slide compares the effect of tight glucose control on the outcomes of most importance to clinical medicine – death, heart attacks, strokes and amputation. Virtually all studies show there is no benefit for any of these outcomes. Statements published that recommend tight control have been slowly dropping since the ACCORD study. When study after study comes out to refute the hypothesis, you might suspect something is up. In 2006, most published statements still recommended tight control. By 2016, only 25% did. That is, the overwhelming majority of experts knew that tight blood glucose control was irrelevant. So, why do we still obsess over blood glucose numbers in T2D? Unfortunately, it’s likely because diabetes specialists have not yet understood that this disease is about hyperinsulinemia, not hyperglycaemia. The drug companies, on the other hand, are all to happy to leave the status quo, which is extraordinarily profitable for them. Excellent Jason – very high glucose not good for body – but striving to lower some moderate levels with expensive drugs is stupid. Sensible, but not profitable, except of course for the individual and society. I remember reading about the antiseptic revolution, and the cultural resistance by established surgeons, and other medical folks, to the mere inconvenience of washing hands between patients. With billions of (name your currency) at stake, in addition to professional reputations, licensing, and god knows how many other issues, will any weight of scientific osmotic pressure shift the paradigm? Waiting for the retirement or death of the old guard of medical societies is one thing, but will greed ever pass? Dr. Fung, I’m lost in the continuity. Since then, There have been other posts, but none that I can find with T2D 14 or T2D 15 reference. I had those posts saved in pdf, but at the time of their publication, they were not labelled as T2D 14 and 15. So how can we measure insulin levels? What is the alternative to testing blood glucose numbers? We tried to get an insulin test from our doctor, but he said it was a “waste of resources”. WOW. Had one done when we were 4 days into fasting, and my husband was at <1, which is what is to be expected under the circumstances. We have yet to get one done under normal eating routine. Tight glucose control and A1c goals are not in themselves the problem. It’s the methods you use to achieve those that are the issue. I can’t measure insulin at home but I can use a glucometer to make sure that the food I’m putting in my mouth isn’t going to provoke an out of whack insulin response. Same here. And morning fasting glucose is very good to check and regulated with foods. Result: lots of fats, and vegetables, no processed foods and careful with proteins give good readings. When water fasting for 2-3 days blood glucose have been just over 3 for me and since energy then is way up over normal, the “hypoglycemia” is matched with ketones. After a while no measurements needed, but glucose meter is good to “tune in”. The best way to discover the truth concerning health and health care is to experience health building (holistic health, alternative healing, complementary medicine, taking responsibility for one’s own health, whatever people want to call it) for one’s self, as people here with Dr. Fung are experiencing left and right. The more that they do experience real health building, the more that they will learn to disrespect the conventional medical authorities. Let’s just stop eating sugar and flour and keep it simple to solve the problem. We do not need donuts to live! Careful Dave…treading into scary water here. Dr Fung. I’ve always been curious about this. From your office to the Canadian Diabetes Association offices is what? Ten miles as the crow flies ? Or is that a silly question? I would guess that the majority of their funding comes from Pharma. The phrase “bite the hand that feeds you” comes to mind here. As Dr. Fung has said earlier, there’s a lot of money at stake here, right down to individuals’ salaries. Why change your tune when you can make lots of money by sticking to the story that every doctor was taught in medical school? Seems like a safe, profitable strategy. So what’s the answer? All I see is a bunch of digital diarrhea. If hyperglycemia is the symptom of too much insulin is it right to conclude then that hyperglycemia is natural response (read a feature of human development not a flaw a la John Durrant) intended to save the body from storing additional sugar where there is no room? I’m not T2 so I don’t know what the dangers are of not addressing the hyperglycemia. Is there greater damage done to the patient by cramming sugar into the body rather than letting it course through their blood? Doesn’t the excess sugar eventually get expelled naturally in the urine? Whether it’s right or wrong I don’t know but those were my thoughts back in 2009. I also had some faith in the wisdom of the human body. “Enola Gay kiss” you paint word pictures that are funny and stay with me. Wish we could measure our insulin resistance like we can our blood glucose. I can get my insulin level every 3 months but that may not be more meaningful that a frog hair to tell me what my insulin resistance is. Thank you sharing this paper, I have been looking for an insulin proxy and this one looks great ! You’re welcome! I was unaware of it till I found it referenced on Dr. Georgia Ede’s excellent Diagnosis: Diet site. Thanks for sharing. I have been reading the published reports available on the development of this proxy for insulin resistance. It looks good to me. What does it mean to increase insulin action but not insulin? Increasing insulin action actually means increasing your body’s sensitivity to it. Thus, the insulin’s activities are able to do more even though the dose of insulin has not been increased. Go Jason!! Your book should be out soon…pre-ordered it and looking forward to it. Why not just use 3 of the Insulin lowering techniques? And .6 grams of protein per kilo of weight. What about T1? They should have low insulin level unless they have perfect A1c? (which most don’t have) so their average insulin level should be lower than people in general or normal (except occasionally when they are low) unless they are T2 also, and still they have higher ‘overall deaths, heart attacks, or strokes’. So surely it is not as simple as you say, blood sugar does play a role. Well, T1 diabetics have lots of insulin because they are taking it. That is the definition of type 1, they are “insulin dependent”. And by the time they are having their cardiac events they have been diabetic and on insulin for many years. But why would a type 1 take more insulin than a none diabetic produces, the definition of Type 1 is ‘cant produce insulin’, so they need to inject, so they need to inject the same amount that a none diabetic produces naturally, nothing more, unless they are type 2 also. I haven’t gotten any replies…maybe I didn’t do it right? So the two key approaches are to reduce carbohydrates, especially low fiber fast carbohydrates, replacing these with protein and traditional fats. The second approach is to increase insulin sensitivity by exercise, eating certain foods like blueberries, grapes, and apples known to promote this and take nutrients associated with improved sensitivity like chromium, biotin, Niacin, and the B vitamins. You can also increase protein, fiber, and natural fats while avoiding vegetable oils to improve health.